In the previous episode, I said one of the best ways to bring about abundance is to tap into your essence. 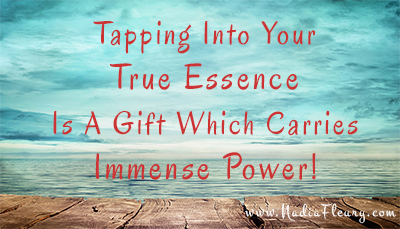 Today I am going to share, from experience, how understanding the importance of masculine and feminine energy has had a huge impact on my growth. I grew up in the country, where hanging out with my brothers, male cousins, and friends were more fun than doing “girl” chores. I couldn’t always escape my mom’s to-do list, but I preferred being outside playing hide-and-seek in the cornfield or watching the older boys doing stunts with their banana seat chopper bikes. Of course, I couldn’t ever participate in their stunts, as I was a girl! In my late teens, I found myself so attracted to the bad boy, male-driven energy of the ’80s: long hair, rock music, and the smell of Azzaro. I wanted to be one of them. In my 20s, I started taking care of myself financially and became career-driven. During that time, society, in general, was promoting being a Wonder Woman, like fighting for the corner office with the bay window. Working late hours on top of taking care of house chores and seeing to children’s needs was not only normal, it was expected. ARE YOU DISCONNECTED FROM YOUR TRUE ESSENCE? The sad truth is that a woman’s body is not biologically and hormonally designed to handle a man’s stress. There is now a shift in society. Many women have learned the hard way that emulating men is not their strong suit. In each of us, we have male and female energy. The key is to know where your healthy balance is. 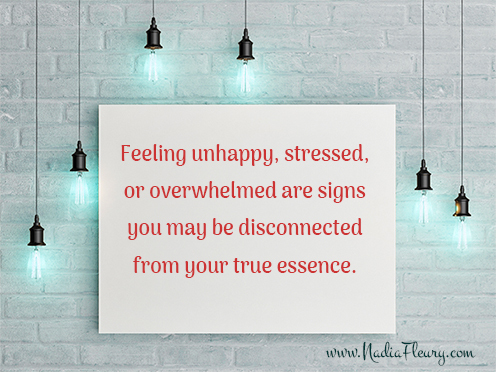 If you find yourself always feeling unhappy, stressed, or overwhelmed, these are signs that you may be disconnected from your true essence. Now, I know there are times when we have deadlines to meet. But that shouldn’t be our norm for the next 20 years. Although I have more often been male-energy driven, cooking and raising my son with my naturally loving and cuddling mother instinct has kept me in balance. 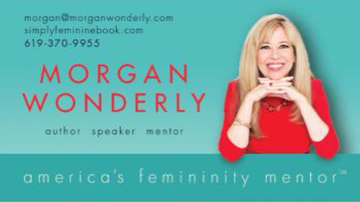 In 2016, I met author Morgan Wonderly, who wrote "Simply Feminine: Surprising Insights from Men". I learned for the first time about the importance of understanding how male and female energy works. I also learned about the side effects of a relationship when it’s out of balance, meaning when a man is too much in his feminine energy and when a woman is too much in her masculine energy. “Western media and society have suggested that femininity is, for the most part, weak, insignificant, and subordinate. Due to this negative social conditioning and devaluation, we have come to view femininity as undesirable. The beauty of these fine qualities has been dulled and diminished. And so, we have largely stopped expressing our authentic feminine core for fear of being ostracized or judged. “Though we have been conditioned for decades to believe that the masculine persona is worthier and more valuable than the feminine, the reality is that shifting into predominantly masculine energy only serves to weaken us. Our feminine bodies aren’t biologically and hormonally designed to handle the type of stress masculine men can handle. A masculine man thrives on the energy of being mission-driven. He’s pumped when he’s tackling large-scale problems, being heroic, physically protecting loved ones and tribes, and inspired by radiant feminine energy to overcome challenges and break through to a sense of freedom. A feminine woman, on the other hand, thrives on relating, connection, compassion, empathy, radiance, and softly influencing others (especially men) through her inner and outer beauty. Losing our sense of trust and intuition. I have to say that it wasn’t easy for me to be vulnerable and admit that I needed help. As much as I complained about not finding “good men,” I knew why I couldn’t find them. In moving away from my femininity, true men moved away from me. Men know what’s feminine, just as we know what is masculine. Men are the beholders of femininity; it’s the basis of their attraction for us. Good men respect our femininity; we have gifts they appreciate, value, and need. Men see women as more precious than they see themselves. Men are less critical of us than we are of ourselves. Men who choose us aren’t looking to change us. Men are starved for our femininity. Men adore the little things we do. Our femininity brings out the best in men. Men are saddened by our media-induced insecurities. If you’re curious about what men love most, here’s what Morgan has discovered: the sexiest thing for a man is a woman’s smile. “Our smiles top the list of attractive features because, from the perspective of men, a smile is the most important visual first impression. The next thing after the smile is eye contact. “Men love dresses and skirts on us wherever you go if you want to stand out in the sea of women, wear dresses in feminine colors. I will say, I have the eye contact and the smile; however, I’m still happier in jeans than in a dress. I relate to Wonder Woman in the scene where she arrives in England and she’s trying on some clothes. She’s not too excited about the clothes that limit her body movement. I think my preference for jeans is out of convenience. All that said, I learned that true power is to simply be yourself. Regardless of whether you’re a man or a woman, having the strength to show up as who you are is powerful. It allows you to feel calm and assured. 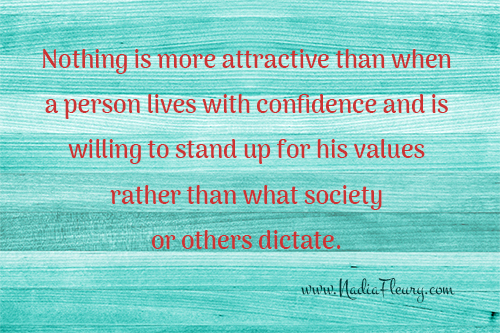 Nothing is more attractive than when a person lives with confidence and is willing to stand up for his or her values rather than what society or others dictate. About seven months ago, I decided to go on a dating site for the first time, just to see. Now, mind you, I haven’t dated in more than 25 years. So, I got curious. I’m clueless about the “new ways of showing up.” Not thinking to check what others were doing, I just set up my profile in the most authentic way. No fake nicknames. I just described myself the way I am. Well, a week later, I canceled my subscription. In truth, I wasn’t ready to find my so-called “soul mate.” I also learned that people are somewhat shy about saying who they really are. Some are looking for partners to make them happy. I said it before, and I will repeat it. Happiness starts from within you. Why is it so difficult to be ourselves? I found true happiness once I tapped into my femininity. I learned how to tap into it when I went to a personal development camp. In a particular exercise, I was challenged to defend myself against someone who was threatening my son’s life. I had to fight without using physical touch or sound, just energy, and thoughts. That was when I discovered my true essence, which is simply love. 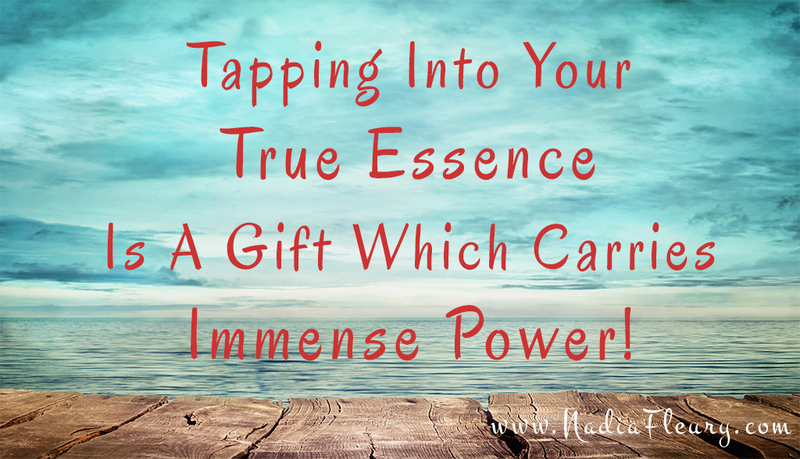 I believe tapping into your true essence is a gift which carries immense power. The power is not a force you use against someone to gain something. The power is within you. I thought for the longest time that to be strong meant to be able to lift heavy weight. That’s one type of strength. The mind is more powerful. 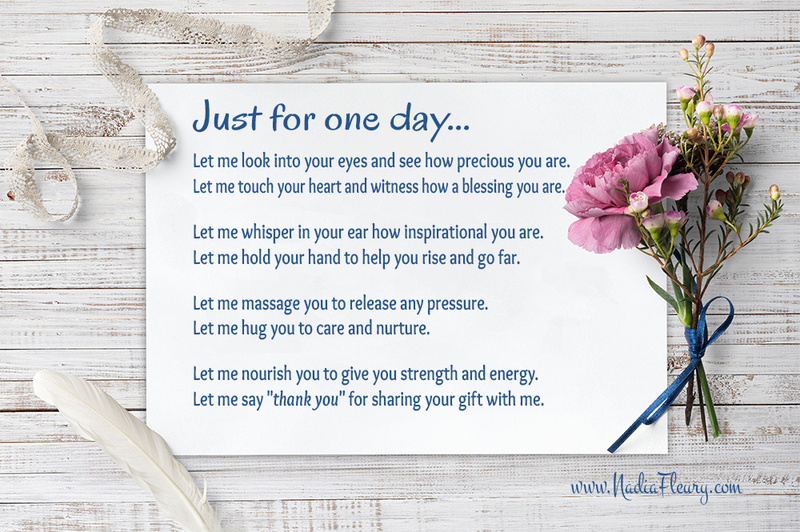 With one sentence, you can make someone feel good, bad, cry, or energized. It’s the energy of the sentence that conveys its strength. “Nothing makes a man feel more masculine than being with a feminine woman who recognizes and acknowledges his manly qualities and gives him her nurturing, loving, soft energy. Her femininity brings extra vibrancy and life to his masculinity. A few days ago, I experienced what Morgan says. I invited my new friend, Mick, for lunch. Mick is a confident, purpose-driven, hero type of man. Knowing his birthday was coming up, I went out of my way to make this day extra special. He arrived early and greeted me with a balloon printed with butterflies. I thought it was cute coming from this masculine man. Looking back on the event, I was surprised to see myself catering to him in my most feminine way—with grace and confidence. I paid attention to the details, from mixing an exquisite salad to serving him samples of the food that just came out of the oven, giving him a preview of what lunch would taste like. As we were getting to know each other, I could feel mutual respect. We took turns sharing our past experiences. When he talked, I looked into his eyes as well as at his handsome features, thinking in my mind about how I admired him. At one point in our conversation, I shared that I wasn’t a competitive person, meaning that I thrive on collaborating with people. And he wholeheartedly disagreed with my statement. We went back and forth on this. I added that I don’t jab people in the ribs to get what I want; I focus on being kind. After a while of having this discussion, he went straight to the core and asked me, “What do you think of the status quo?” To that, I had no word. He was right; he saw right through me. I’m competitive, as I always seek to progress forward. And he added that he knew I would go to any length to get what I wanted in life. I flushed and smiled at him, acknowledging his wisdom. "GOOD MEN WILL WANT TO WIN WITH US "
Well, a man has to win a debate; a good man will want to win with me. So he added, “It doesn’t have to be ‘or,’ it can be ‘and,’ meaning you are competitive and collaborative at the same time.” He added that it can be a good thing to sometimes “jab” people in the ribs. You move them into action. If they get jabbed, it’s because they were not moving. I gave him an admiring look. After lunch, I served him a birthday cake. I had planned for the candles but I hadn’t planned to sing, as I do not have a singing voice. I pushed myself out of my comfort zone and chose, just for him, to sing a French version of the birthday song. He gracefully received the song with a smile and a hug. The cake now is gone, and my balloon is a little deflated. However, the memory of this day will always be fresh in my mind. For the first time in decades, I experienced what it means to be in my “true essence.” With him around, I became a woman of substance. If you enjoy this blog post, please leave a comment or share it. Thank you, Morgan, for taking the time to compile this lovely book and share it with us. I know it took you over ten years to bring this project to us and I truly appreciate the wisdom you put into this book. Wonderly, Morgan. Simply Feminine: Surprising Insights from Men (Kindle Location 13-14). Crescendo Publishing LLC. Kindle Edition. Wonderly, Morgan. 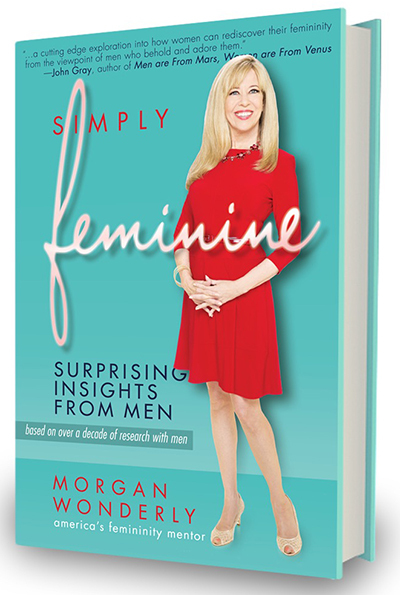 Simply Feminine: Surprising Insights from Men (Kindle Location 203-205). Crescendo Publishing LLC. Kindle Edition. Wonderly, Morgan. Simply Feminine: Surprising Insights from Men (Kindle Location 203-222). Crescendo Publishing LLC. Kindle Edition. Wonderly, Morgan. Simply Feminine: Surprising Insights from Men (Kindle Location289-293). Crescendo Publishing LLC. Kindle Edition. Wonderly, Morgan. Simply Feminine: Surprising Insights from Men (Kindle Location 299-303). Crescendo Publishing LLC. Kindle Edition. Wonderly, Morgan. Simply Feminine: Surprising Insights from Men (Kindle Location 459-465). Crescendo Publishing LLC. Kindle Edition. Wonderly, Morgan. Simply Feminine: Surprising Insights from Men (Kindle Location 1501-1505). Crescendo Publishing LLC. Kindle Edition. Wonderly, Morgan. Simply Feminine: Surprising Insights from Men (Kindle Location 1515). Crescendo Publishing LLC. Kindle Edition. Wonderly, Morgan. Simply Feminine: Surprising Insights from Men (Kindle Location 1521-1522). Crescendo Publishing LLC. Kindle Edition. Wonderly, Morgan. Simply Feminine: Surprising Insights from Men (Kindle Location 1526). Crescendo Publishing LLC. Kindle Edition. Wonderly, Morgan. Simply Feminine: Surprising Insights from Men (Kindle Location 1521-1530). Crescendo Publishing LLC. Kindle Edition. Wonderly, Morgan. Simply Feminine: Surprising Insights from Men (Kindle Location 394-398). Crescendo Publishing LLC. Kindle Edition. Wonderly, Morgan. Simply Feminine: Surprising Insights from Men (Kindle Location 404-405). Crescendo Publishing LLC. Kindle Edition. Wonderly, Morgan. Simply Feminine: Surprising Insights from Men (Kindle Location 394). Crescendo Publishing LLC. Kindle Edition. Wonderly, Morgan. Simply Feminine: Surprising Insights from Men (Kindle Location 646). Crescendo Publishing LLC. Kindle Edition.